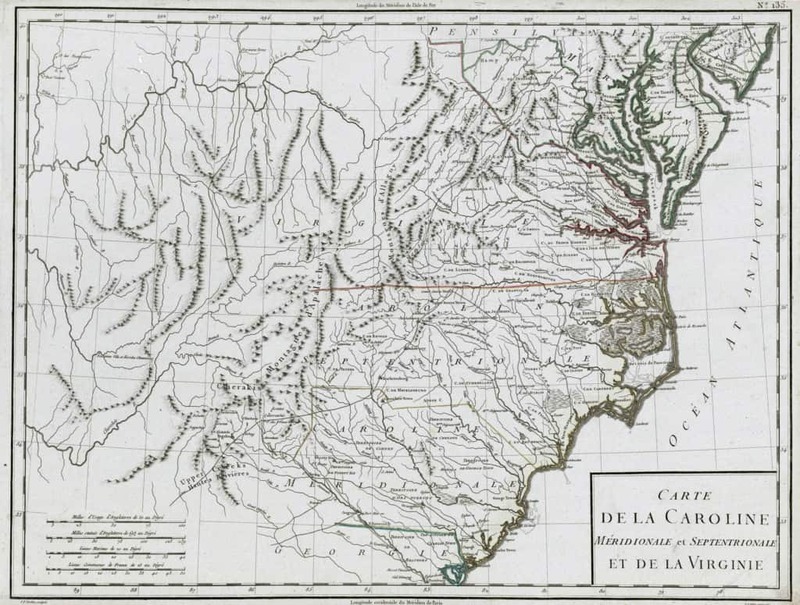 Cartographic historians and collectors of 18th Century maps of what is now Virginia and the Carolinas love “wow” maps, such as the Churton-Collet map of North Carolina and the Fry-Jefferson map of Virginia. A few maps, such as Carte de la Caroline Meridionale et Septentrionale et de la Virginie, receive no love at all and are essentially ignored. Why is that? Quite simply, the map shown below is not historically important, it does not have a visually stunning cartouche, and it isn’t printed in English. Additionally, the map is undated and surviving copies of the atlas(es) in which it was published are so scarce that proper attribution is difficult. Without getting up out of our La-Z-Boy, let’s see what the internet can tell us about this map. Q: Who drew it? Who engraved it? A: Fortunately, the engraved map has imprints identifying the cartographer (P. J. Valet) and the engraver (P. F. Tardieu). Q: When was it published, who published it, and in what format? A: The map is undated. Reported dates of publication in WorldCat range from the 1770s to 1816, the earliest dates without any documentary evidence. Internet searches have turned up one copy of an intact digitized atlas containing this map: Atlas universel de Geographie physique et politique ancienne et moderne, published by Edmé Mentelle and Pierre-Grégoire Chanlaire. The title page for this copy of the atlas is dated 1806. Other copies of the atlas have a title page indicating publication in Year 6 of the French Republic, correlating to publication some time between 22 September 1797 and 21 September 1798. My feeble efforts at reading French (mis)lead me to believe the atlas (with an original title of Atlas Nouveau) was published serially in the 1780s, with a total of 98 maps completed by 1789 and a total of 168 maps completed by 1798. As of 1806, the atlas containing 171 maps was priced from 150 Fr to 300 Fr, depending on paper quality, binding, and coloring. One library reports an 1816 edition of the atlas, but a list of maps in that copy is not included in the on line catalog. Q: What sources were used to compile the map? A: The Carolinas and Georgia are largely derived from the 1775 map of the Carolinas drawn by Louis Delarochette (the so-called “Mouzon map”). The Fry-Jefferson map of Virginia appears to be the major source for that region. I’ll leave the Trans-Allegheny region for someone else. Q: How many states of the map are there? A: At least four states have been identified, the differences pertaining only to engraved plate or page numbers outside the neat line at the top left and top right. State 1: No imprints at top left or top right, and no evidence of erasures. State 2: No imprint at top left, “No. 135” at top right. State 3: “No. 158” at top left, “No. 135” at top right. State 4: “No. 159” at top left, “136” at top right. I have this in my notes, but did not document where I saw it. If anyone locates an image matching this map, please let me know. I stumbled upon it once and haven’t been able to relocate it. Thus far, efforts to correlate the state of a map with the date of publication have not provided clarity. If anyone has a copy of Mentelle’s Atlas Nouveau or Atlas Universel, please inspect it for title page date and page/plate imprints on the Carte de la Caroline… You may use the “What’s on your mind?” comment box below to share your findings. The single example of Atlas Universel that has been digitized on line has an 1806 title page and includes a “State 3” of the Carte de la Caroline... The map of the U.S. in that copy of the atlas still contains the first state of the U.S. map, describing Vermont as not yet part of the confederation (even though Vermont officially joined the U.S. in 1791). Q: Is there anything interesting about this map? Pelham County: The above map is one of a handful that show a “Pelham County” in North Carolina. There is no such county and there never was any county by that name. That particular place name made its first cartographic appearance on James Wimble’s 1738 chart of North Carolina, where one will find “Pelham Pre[cinct]” just below the title cartouche. Wimble was soliciting financial assistance from Thomas Pelham to get the chart engraved and printed, so why not give the benefactor his own county! Unfortunately, a London cartographer unwittingly perpetuated this cartographic fiction in 1775. Louis Delarochette copied Pelham County from Wimble’s chart onto the “Mouzon map.” From there, it was copied onto several French maps produced during the Revolutionary War and onto several small maps engraved for London periodicals during that same period. What’s with that state boundary?! 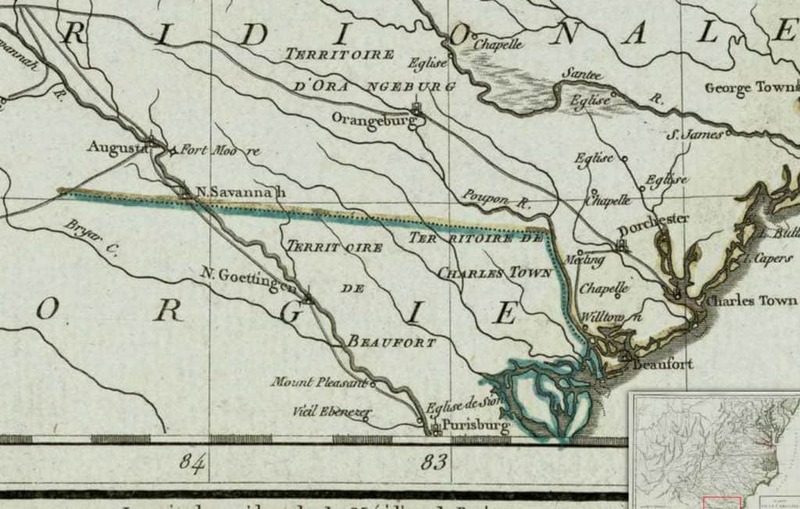 The Valet/Tardieu map shown above and another French map by Rigobert Bonne from the same period have a bizarre border between South Carolina and Georgia. At no point on this map does the Savannah River form a boundary between the two states. The boundary goes up the Edisto River (in SC) to a nebulous point, then turns and makes a straight line WNW. As a result, all of Hilton Head Island and Beaufort County, SC, are in Georgia, and Augusta, GA, is in South Carolina. I have been unable to find any historical basis for this bizarre boundary. Do you have primary source evidence for the origin of this misplaced boundary? If so, please use the “What’s on your mind?” comment box below to share with us. Researching this map provides more frustration than answers. No wonder it doesn’t receive much love. This entry was posted in 18th Century, Cartobibliography and tagged Antoine Francois Tardieu, Atlas Universel, Carte de la Caroline, Edme Mentelle, Pasquier Jean Valet, Pelham County, Pierre Francois Tardieu, Pierre-Grégoire Chanlaire by crmaps. Bookmark the permalink.